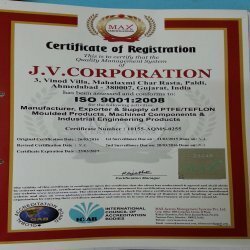 We, J. V. Corporation, established in year 1992, is engaged in manufacturing, supplying & exporting a wide collection of PTFE & Teflon Moulded and Machine Components. Our wide range includes Chemically Treated Sheets, PTFE Ball Valve Seats, PTFE Bushes, PTFE Rods, PTFE Nozzles, PTFE Keys. Further, we are also engaged in offering wide range of Teflon Sleeves, Bushes, Tapes, Gaskets & Rings. We have two state of the art and highly equipped production units that follow standardized procedures for the entire manufacturing function. We closely inspect each stage of production process, so as to be able to maintain the desired quality. We ensure that the raw material we use is of premium quality only. Under the guidance of Mr. Jigen Shah (Director), we have created a niche for ourselves in this industry. Due to our vast product range & quality material used, we have attained a huge clientele from all across the globe. It is unaffected by virtually all acids and caustics and functions in environment upto 500 degrees F.
PTFE is one of the best insulators known. In thin sections, it will insulate upto 500 volts per mil. Filler grades of PTFE have greater dielectric strength. It is frequently used in wire and cable. PTFE can be machined for use in insulators and many different types of high voltage encapsulation devices for electrical components. PTFE has characteristics of inertness and can operate in temperature ranging is from - 350 degree F to 550 degree F.
Various components of PTTE used in chip manufacturing and for heaters. Virgin PTTE is approved by the Food and Drug Administration for use in the food, beverage, cosmetics and pharmaceutical industries. PTFE components like guide rails and slides-can withstand high temperatures inside baking and drying ovens and other heated segments of the food, cosmetics or pharmaceuticals manufacturing processes. PTFE components are used in various laboratory ware because of their chemical resistance and inertness. Glass filled PTFE can be cut or stamped into bearing pads. It will act as inert interface between various constructions material such as steel & concrete. 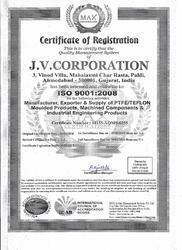 We believe in concept of total quality management encompassing materials, machines, manpower & process. State of the art manufacturing & quality control facility automated machineries, trained & skilled engineers, sourcing of materials backed by standard operating procedure facilitate quality of highest standard at each stage of manufacturing. Strict adherence to prescribed standards consistent quality output.